)f reaching the overall $7.2 million goal. in Israel and Jewish causes. The speaker at the 5 p.m.
$2,500 second prize and four $500 third prizes. here to ask for political asylum . safety, I will not be free ." an individual and creative spirit. reference sources and JDC staff reports. home, in Israel and around the world." Sherr, Edward and Ethel Waldman. Symons, Gerald and Lorraine William. 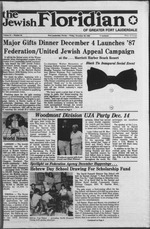 weekly issues of the Floridian. taxes on the appreciated value. This, too, will change next year." School assistant director, at 583-6100.
from the annual United Jewish Appeal campaign. dent and Fran Merenstein is executive director. there were no pollutants, no urban wastes, no additives. and what their dollars do. leaders were also told of the Dec. Towers, and the Regency South. calls for the resignation of U.S.
man of the Joint Chiefs of Staff. to America and to world Jewry. Jerusalem," which was led by Dr.
total campaign figures of 1975.
munity for over 25 years. provide you and your spouse income for life. programs, contact: Janice Salit, director. made a federal case of it. you see so many nice Jewish boys with their heads covered?" alternating yeahiva learning and military service," he says. course, their religious sensitivities are respected. Supreme Court ruling on yarmuUces. could lead to the loss of her job. jam with a caffeine-free drink. paigner in the Atlanta, Ga. Thanks to You, It's Working . her family used to have. that we can all be grateful. Broward County's old and young alike. We are able to do this, because of you. POSTMASTER: Send address change,, to The Jewish Floridian. gave the appearance of blood. and this Jew lives in Jerusalem,"
signifies a gift of $5,000 or more. paign, will be the guest speaker. arteect. iMi" raisin. PINTERS Site*. paign on Sunday, Jan. 4 at 10 a.m.
at Temple Beth Israel, 7100 W.
Saturday evening, Dec. 6 at 8 p.m.
local young leader, Jo Ann Levy. tler at the Federation, 748-8400.
tion, 8358 W. Oakland Park Blvd. such a qualified individual as Mr.
chairman; and Arthur Charney. Cantor; and M. Morris Wittenberg, 1986 and '87 co-chairman. New York Times referred to Mr.
Club at approximately 1:30 p.m.
tion will reimburse mileage and film cost. Call Marvin Le Vine, 748-8400. Dec. 1 Women's Division P.M. Network. Dec. 2 Inverrary Lecture Series. 9:30 a.m.
Dec. 4 Business Executive Network. bi Larry Rubenstein, will be the seminar leader. tions will be worth less after 1986. ($1,000 gift less $400 tax savings). wish to hold for a very long term. and Gordon Smith, deputy director of the SDI Organization. cash collections and 63.5 percent in pledges. support the appointment of women in local religious councils. lustrate this tax saving technique. $1,200 less $800 tax savings)? must transfer the stock to charity. which you may wish to benefit. Chinese luncheon and card party. Rich Gardens, Sunrise. Cost $10. 16650 Saddle Club Rd. 389-4689.
for her 60 member choral group. Call the Center for information. parent, one on his own! 797-0331. Scott Dorustein reciting the blessings over the candles and wine. Jew from year to year? To G-d who shows the way. Our thanks must have no end. For all that He gave us. verbs describe a good name? on Fifth Ave and 42 St.
by the Jewish Publication Society. 7- Money lending and Peddling. good name is preferable to riches. by the lighting of the menorah. tact Stan Kane at 753-3653.
day 8:45 a.m. Rabbi Kart F. Stoae. dairy 8 a.m.; Sabbath 8 p.m.. Sabbath morning 8:46 a.m. Rabbi Avrahaai Kapnek. Saturday 8:46 a-m.. 7:45 p.m. Rabbi Howard A. AdeUsoo, Caator Maariee A. Ne*. Blvd., Deerfield Beach, 33441. Service*: Sunday through Friday 8:30 a.m., 6 p.m.
J.asah Ifar. Caatar Sacbtal Aekanaaa. TEMPLE B'NAI M08HE (942-6880), 14S4 SE 3rd St. Pompano Beach. 33060.
lane. Friday 8 p.m. Caator Jihassh HeUbraaa. TEMPLE SHA'ARAY TZEDEK 741-0296), 4099 Pine Island Rd.. Sunrise, 33321.
day 8:46 a-m., 6 p.m. Rabbi RaadaD Kialgliarg. Caator Jack Merchant. 8:46 a.m. RabM Israel Haiaera. p.m., Saturday at 8:45 a.m. Charles B. Frier, Praaidaat (722-7607). 8 a.m., 5 p.m., Saturday 8:46 a.m., 6 p.m.
l 8 mi. RabM Aroa Li.bera.aa. Da si Bald Beach. 88441. Borvitoo: Sunday through Friday 8 a.m. and sundown. Friday 8 p.m.; Saturday 10 am Rabbi Mark W. Grans. "| Chapels, 2806 W. Hillaboro Blvd., Deerfield Beach. 8S441. Friday 8 p.m.
i H. Fish. Caator Morris Leviasoa. TEMPLE EMANU-EL(731-2810). 3246 W. Oakland Park Blvd., Lauderdale Lakes. Bat Mitavah. RabM Jeffrey Ball**. Caatar RRa Share. CresA Parkway Rabbi Brae* 8. Warsbal. Caatar Barbara Roberta. as 44 percent under the new law. the same gift in 1987." give than in subsequent years." Brown when they do it." E. 26 St., New York, N.Y. 10010; 212-532-4949.
panies doing business in South Africa. ble to play in Israel. counseling and information sharing sessions." reachable one over the long term. the net cost of the gift $6,000. in tax savings of $1,160. Federation. The answer is simple. year, instead of all at one shot. be held at 7:30 p.m., Sunday, Dec.
7 at the Sunrise Music Theater. East will appear on Sunday, Dec.